"The hardest trick is making them stay.". 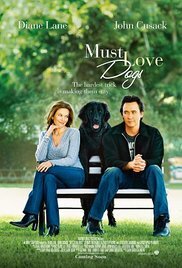 Must Love Dogs tells the story of Sarah Nolan (Diane Lane), a newly divorced woman cautiously rediscovering romance with the enthusiastic but often misguided help of her well-meaning family. As she braves a series of hilarious disastrous mismatches and first dates, Sarah begins to trust her own instincts again and learns that. no matter what, it's never a good idea to give up on love.